I have been fascinated by abandoned and historical buildings since my first photography assignment in high school. The assignment was to simply shoot a roll of film over the weekend with the subject being anything that was of interest. On our way to my grandmother's house, my dad and I passed what used to be the Harlem Valley Psychiatric Center, now a gigantic vacant campus. I asked my dad to pull over so that I could take some pictures. We took the "No Trespassing" signs as nothing more than a warning to be careful so we walked onto the grounds and began looking around. After exploring the abandoned hospital that day, and finding out more about it online, my new obsession was born. Six years later, my passion for discovering and documenting abandoned buildings has only grown. This is a digital space where these places can live eternally, since holding their existence as nothing but a memory is soon becoming the sad reality as they come to an end in the physical world. With the demand for their property, these buildings are being demolished or leveled and replaced by condominium complexes and shopping centers. Although, vandals, time and the forces of nature work more quickly than demolition crews, they still leave us with something to hold onto. 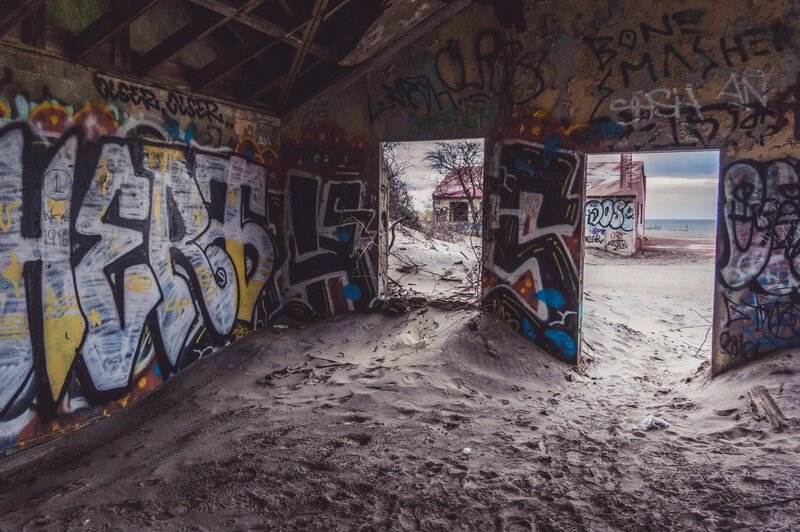 "Urban Explorers", adventurous photographers, and those who are curious, looking to uncover artifacts, have been keeping these ruins company since their last occupants fled. Abandoned But Not Forgotten is an online space giving eternal life to the historical places that have stories willing to tell to anyone that listens. My photos, the narratives of creative writers, and the work of other talented photographers and authors can all tell the stories that lie within the walls of each and every one of these places. Here you can find their history as well as a find a creative perspective on what these places mean and what these places are. "The first few doors I tried were locked, the handles refusing to budge in any direction. Continuing down the hallway I tried door after door until finally an entry proved successful. Unfortunately long gone were any remnants of past experiments. The labs were empty and clean; drawers and shelves void of equipment, left only to collect dust. Stainless steel faucets and piping sparkled as if they had just been cleaned only days ago."